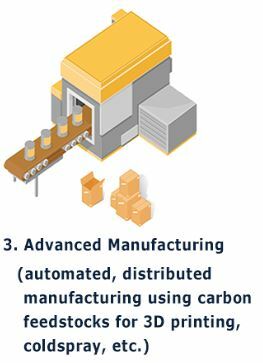 Carbon capture and utilization (CCU) is the process of capturing greenhouse gases such as carbon dioxide (CO2) and methane, either from the open atmosphere or from large point sources, such as fossil fuel power plants, and then convert it for use in marketable products. These technologies will soon be cost effective and scalable to capturing gigatons of greenhouse gases per year. 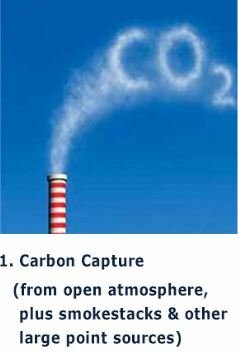 In the past, the idea of carbon capture was limited to preventing the release of large quantities of CO2 into the atmosphere (from fossil fuel use in power generation and other industries), then transporting it to a storage site, and depositing it where it will not enter the atmosphere, normally in an underground geological formation. Such a practice was risky, however, and was never able to demonstrate its feasibility at the necessary large scale. A few projects have demonstrated success in capturing greenhouse in large quantities at smokestack and then converting it into a useful feedstock for manufacturing. More interesting are a set of new companies and technologies — known as Direct Air Capture — working to capture quantities of CO2 from the ambient air, and less expensively than from a smokestack. The Climeworks CO2 capture technology is based on a cyclic adsorption / desorption process on a novel filter material (“sorbent”). During adsorption, atmospheric CO2 is chemically bound to the sorbent’s surface. Once the sorbent is saturated, the CO2 is driven off the sorbent by heating it to 100 °C, thereby delivering high-purity gaseous CO2. The CO2-free sorbent can be re-used for many adsorption/desorption cycles. The beauty of the process is the fact that around 90% of the energy demand can be supplied by low-temperature heat; the remaining energy is required in the form of electricity for pumping and control purposes. Carbon Engineering’s air contactor absorbs atmospheric CO2 into our capture solution to produce a liquid solution that is rich in CO2. The regeneration process, involving several processing steps, produces a purified stream of CO2 and re-makes the original capture chemical. 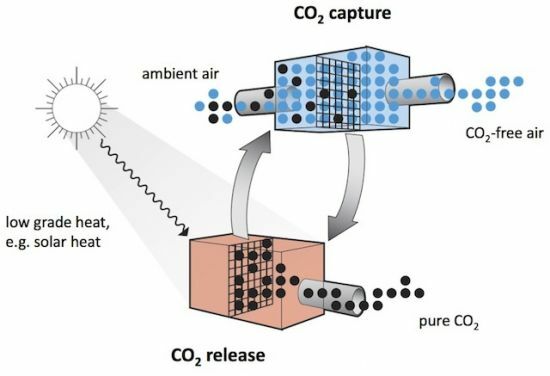 These two processes work together to enable continuous capture of CO2 from atmospheric air, with energy (and small amounts of make-up chemicals) as an input, and pure CO2 as an output. The stream of pure CO2 can be sold and used in industrial applications and/or permanently sequestered (geologically stored) deep underground. 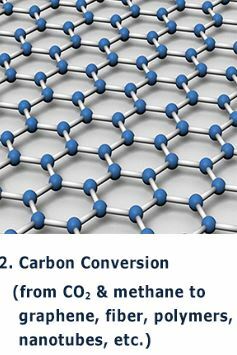 The Carbon Engineering capture technology brings atmospheric air containing CO2 into contact with a chemical solution that naturally absorbs CO2, in a device called a contactor. This solution, now containing the captured CO2, is sent to a regeneration cycle that simultaneously extracts the CO2 while regenerating the original chemical solution, for re-use in the contactor. The extracted CO2 is combined with all the CO2 from the systems energy use and both are delivered as a high-pressure pipeline-quality product. Global Thermostat plants can be stand-alone (pure air), or co-located with large emitters – both new and existing. In fact, Global Thermostat claims that its post-combustion process with an existing power plant is quite simple, and has been done with just a single day of power plant down-time. Global Thermostat enables truly carbon negative electricity generation: a Global Thermostat plant utilizing the residual heat of, and capturing the CO2-rich flue gases from, an adjacent fossil fueled power plant can capture substantially more CO2 than that plant emits. Similarly, Global Thermostat claims to be able to utilize the “harmful” heat byproduct of PV solar farms to power its plants, turning the farms into giant carbon sinks, while increasing their profitability through CO2 sales. Global Thermostat is a New York based company that has introduced completely modular plants – from a single 50,000 tonne/yr. Module to a 40-Module, 2MM tonne/yr. Plant, and larger. A Global Thermostat plant grows by adding more modules. Global Thermostatlants also have a small footprint – capturing from 20-500 Tonnes of CO2/yr./m2 or more, depending on the embodiment used.